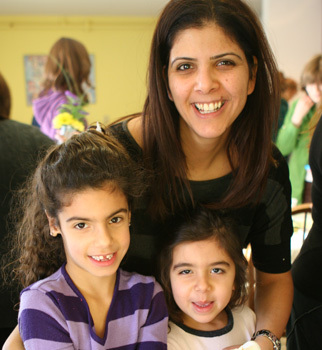 Apply for the funds you need to attend Single Jewish Moms Connect, a gift made possible by your generous Jewish sisters. Depending on your situation, grants could cover up to 100% of the retreat and childcare fees. See Retreat Cost and Childcare below to determine whether you’ll need to apply for a grant. Check “yes” where the sign up form asks, “Will you be applying for a Grant?” After you complete the sign up form and pay the $50 sign up fee, you’ll receive an email with a link to the Grant application. On the Grant application you’ll be asked to write two to three paragraphs summarizing your financial situation and why you’re asking for help. Include the name and number of someone who can serve as a reference for you on the application. Clearly state the dollar amount you can afford to pay, keeping in mind you can set up monthly payments over the six months following the retreat. We may ask for documentation if we need to clarify your situation. All information you submit to us is strictly confidential. Grants do not cover the $50 application fee and do not cover travel expenses. Once you’ve signed up online, submitted your $50 sign up fee and send in your Grant Application, we’ll email your Grant Award within a week. If you need to arrange a monthly payment plan, please email us or call 718.604.0088. These fees do not include the $50 sign up fee and do not include travel expenses. Can’t attend the whole retreat? Want to attend some classes, workshops and meals without overnight accommodations? Please contact us. If you need to arrange a monthly payment plan, email us or call 718.604.0088. It’s our pleasure to help! Email or call us at 718.604.0088 to discuss your childcare needs. We’ll determine the cost based on your child’s age and needs. If you are paying the full retreat fee, or if you received a Partial Grant and are paying your balance, or if you need to make a monthly payment, you can do so here. To arrange monthly payments, email us or call 718.604.0088.